Saddleback Mountain is a 4,120 foot mountain in the High Peaks in Rangeley, Maine in Franklin County. The mountain is the 8th highest peak in Maine and one of the fourteen peaks with a topographic prominence greater than 2,000 feet. The mountain is also known for its ski resort: Saddleback Maine Ski Resort, which is on the north side of the mountain. The mountain rock is primarily granodiorite, which is similar to granite, but contains more plagioclase feldspar than orthoclase feldspar and formed more than 400 million years ago. 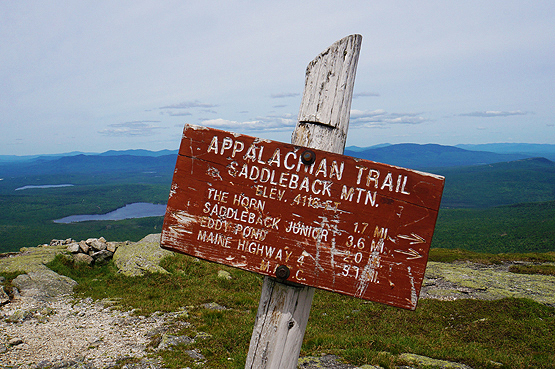 The Appalachian Trail, which spans from Georgia to Maine, runs along the ridge of Saddleback crossing over the summit. This is a great mountain to hike along with Saddleback the Horn, being only 1.6 miles apart. Both summits have 360 degree views on a clear day. Views of the lakes region are breath-taking. Saddleback the Horn is a 4,041 foot mountain in the High Peaks in Rangeley, Maine in Franklin County. The Horn is flanked to the Southwest by Saddleback Mountain, to the Northeast by Saddleback Junior and to the Northwest by Potato Nubble. The mountain is also known for its ski resort: Saddleback Maine Ski Resort, which is on the north side of Saddleback Mountain. The mountain rock is primarily granodiorite, which is similar to granite, but contains more plagioclase feldspar than orthoclase feldspar and formed more than 400 million years ago. The Appalachian Trail, which spans from Georgia to Maine, runs along the ridge of Saddleback crossing over the summit of that and the Horn. This is a great mountain to hike along with Saddleback Mountain, being only 1.6 miles apart. Both summits have 360 degree views on a clear day. Views of the lakes region are breath-taking. Summit of Saddleback Mountain on June 11, 2014. 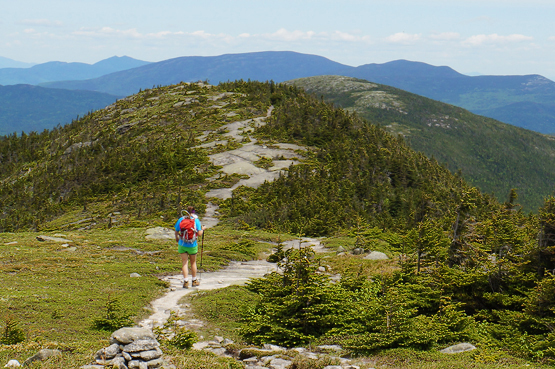 Appalachian Trail between Saddleback Mountain and The Horn on June 11, 2014. 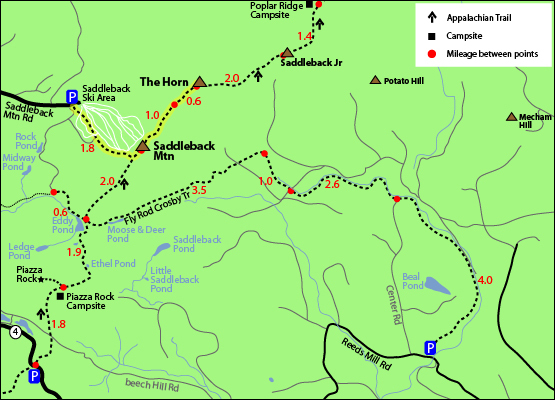 The map below shows how to get to the summit of Saddleback Mountain as well as Saddleback the Horn. Begin at the base lodge and follow the road up the Wheeler Slope to the Grey Ghost and Tri Color trails. Tri Color will bring you to the top of the Kenebago Quqd, where a short, narrow trail behind the upper building leads to Saddleback's summit. To head over to the Horn from the summit of Saddleback Mountain, continue on the Appalachian Trail for 1.6 miles. To get back to the Saddleback Ski Area parking lot, retrace your steps back over Saddleback Mountain and down the Grey Ghost Ski trail. Heading up the Saddleback ski trails - Grey Ghost Trail on June 11, 2014. 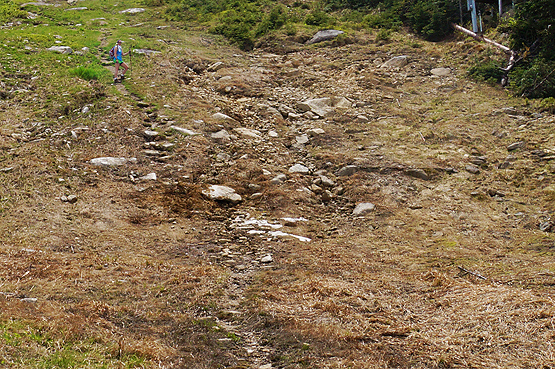 The parking area for this hike is at the Saddleback Maine Ski Resort on Saddleback Mountain Road in Rangeley, Maine. Take Route 16 North, which is East in Maine, to Rangeley, merging and continuing to stay on Route 4 South. Take a left onto Dallas Hill Road, then a right onto the Saddleback Ski Area access road. Parking is available just above the Main Lodge. There are a few parking areas next to the base lodge. If you have a GPS, just put in Saddleback Mountain Road in Rangeley and drive to the end where the ski area is. Need a car spot or taxi? There is a local small business called All Points Transportation run by a man named Greg in the Carrabassett Valley area who can help! If you need a car spot to a trailhead or for any other reason, give him a call to see if he is available. 207-329-3482.